Mother’s intuition? Lauren Leonard has it in spades. Lauren discovered that she was pregnant last March and shortly after; she began to suspect that this pregnancy was unusual. It certainly was unusual. 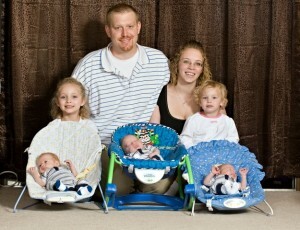 On September 18, the Leonards added three new babies to their family. Without the use of fertility treatments, Lauren had become pregnant with triplets; and not just any triplets – but a set of identicals. A variety of estimates, place the odds anywhere from 1:150,000-160,000 up to 1:200 million. The boys, Joshua, Levi and Kaleb, were born almost two months premature and spent their first month in the neonatal intensive care unit of Winchester Medical Center in Winchester, Nevada. “They came home at the same time, which is unusual,” Lauren said. The couple, who are already parents to daughters, Natalie, 4 and Brooklyn, 2, were just trying for one more baby – a boy when they found out they were expecting 3. He explained that, with identical triplets, “there is one placenta and every baby has its own individual sac.” At this point, that appears to have been the case. So now the Leonard family is making a big transition. Financially, they are extending themselves to pay for the large can of formula and the package of 35 diapers the babies burn through every day. They have relocated from a two bedroom apartment to a three bedroom house, which Joshua renovated himself. They also have more demands on their time but, thankfully, they have some help with that. Joshua’s mother, Karen Leonard, has made plans to move in with the family for the first year. She will tend to all the cooking and cleaning and leave Joshua and Lauren to bond with and parent their children. “As a family we’re pulling together and doing what we can,” Karen said. Prematurity Awareness Month – Meet 27 Weeker Xavier!